Thank you for exploring A Mindset for Learning. In our sample you'll explore how Kristi Mraz and Christine Hertz put the research and findings of Carol Dweck, Daniel Pink, and Arthur Costa into immediately useful classroom action. 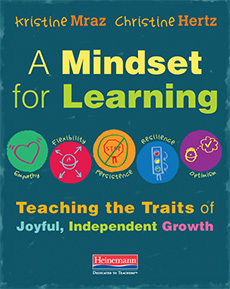 With Kristi and Christine's help you'll teach for a growth mindset, help students find intrinsic motivation, and show them the habits of mind to sustain independence throughout their schooling...and life. Chapter 4 where they show how to introduce these attributes through a guided inquiry.